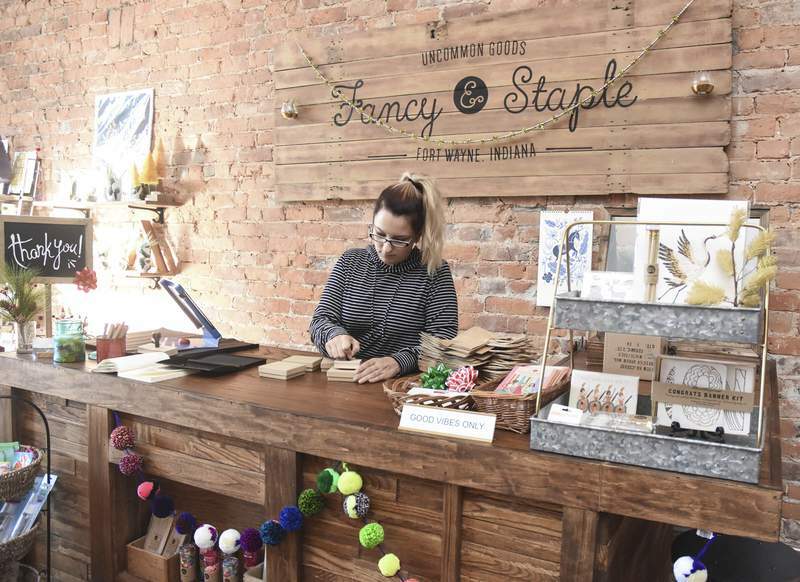 Photos by Michelle Davies | The Journal Gazette Ashley Martin is a manager at Fancy & Staple, 1111 Broadway. The Fort Wayne retailer won’t be open Thanksgiving. Fancy & Staple owner Taber Olinger expects her store to be busy Black Friday and Small Business Saturday. Some folks brag about completing Christmas shopping in October. Others wouldn’t dream of starting before Dec. 24. But most of us fall somewhere in the middle. Survey results from the National Retail Federation show that more than 55 percent of consumers plan to start shopping in November or early December. The challenge for retailers is to be ready and waiting when shoppers decide to crack open their wallets. But retail decision-makers don’t agree when that will be. More stores are betting this year that they can still ring up significant sales without being open Thanksgiving Day. The trend reverses a wave of holiday openings that started about five years ago. Among those that announced plans to remain closed Thanksgiving are Barnes & Noble, Burlington, Half Price Books, Home Depot, Lowe’s and Marshalls. Some merchants are claiming a kind of moral high ground by closing. A Ball State University marketing expert thinks it could result in higher employee morale. But a Purdue University consumer science expert thinks some retailers made the decision to close too hastily. Glenbrook Square, a regional shopping mall, will be open from 6 p.m. until midnight on Thanksgiving. Individual retailers at Glenbrook will decide when – and if – they will open for business. Jefferson Pointe, Glenbrook’s crosstown rival, has decided to close on the holiday. But that doesn’t prevent individual tenants from opening, including Michael’s, Old Navy and Carmike movie theater. The winning strategy could pay off big. The National Retail Federation, a retail industry group in Washington, D.C., has forecast this year’s holiday sales will increase 3.6 percent to almost $656 billion. Taber Olinger, who owns Fancy & Staple, didn’t struggle to decide whether to open Thursday. 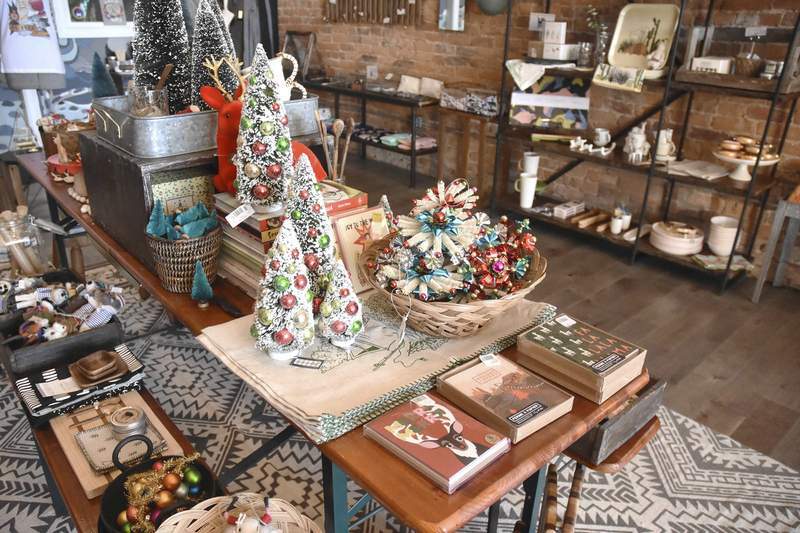 The retail shop at 1111 Broadway carries an eclectic collection of clothing and items for the home and kitchen. "I would never, ever even consider being open during the holidays," she said. "It’s the most wonderful time of the year, truly." Ramon Avila, a Ball State marketing professor, said being scheduled to work Thanksgiving evening can quickly turn sweet holiday spirit into something sour. "People don’t want to walk away from young children or older relatives on what is supposed to be a very special day in our country," he said. Also, spending the holiday with family might be just the break some workers need, Avila said. "Many employees feel overworked and stressed," he said in a statement. "With the economy in much better shape, these same workers may be facing larger crowds this year than in the past." HH Gregg, an Indi­anapo­lis appliances, electronics and furniture chain, is among the retailers that will close after being open on the holiday last year. "We stand behind our core values and beliefs of being a family-first company," President and CEO Bob Riesbeck said in a statement. "It’s important to us that our associates are able to be home with their families on Thanksgiving, and we are encouraging our customers to do the same – knowing great deals will be available online, on Black Friday and through the weekend." HH Gregg stores will reopen at 7 a.m. Friday. Von Maur, an upscale department store with a location in Jefferson Pointe, prides itself on closing for holidays. The family-owned Iowa retailer has closed on all major holidays for more than 140 years. That includes holidays when malls are traditionally filled with shoppers, such as Memorial Day, Labor Day and the Fourth of July. Jim von Maur, the company’s president, said the retailer respects its customers’ and employees’ time with family too much to open on those days. "For us, it is not about how big of lines we can have outside our stores or sales volumes on a particular day," he said in a statement. Von Maur stores will reopen at 9 a.m. Friday, one hour earlier than usual. The retailers are correctly reading shoppers’ sentiments, according to survey results released by consulting firm Morning Consult last week. An early November survey of 2,000 consumers found 59 percent don’t want retailers to open Thanksgiving. Richard Feinberg, a Purdue professor of retail management, disagrees with the assumption workers want to be home on the holiday. "Many employees actually like working the extended hours and really like the extra money they can make," he said. "Our research at Purdue suggests this might apply to more than 50 percent of the employees." Feinberg, interim head of Purdue’s Department of Consumer Science, said retailers could suffer long-term consequences if shoppers find their doors locked on Thanksgiving. "If a customer is forced to spend their money someplace else, they may find that someplace else has more stuff, better stuff, better price, better experience than ‘you’ do, and you may never see them again," he said in a statement. "Or when they think of something else to buy two weeks later, they may go to that other place first." Fancy & Staple’s Olinger isn’t worried about the possibility. "The thought of retailers being open on a holiday, just to get a head start on making those dollars, is a terrible thing," she said in an email. "As a business owner, I feel every (lost sale) personally. Having said that, it’s a sacrifice I don’t even hesitate on. We’ll make up for it on Black Friday and Small Business Saturday for sure." Fancy & Staple is among the shops on the Holly Trolley Shopping route on Saturday. Shoppers taking the silver line will find a stop right in front of the store. Some retailers don’t even entertain the idea of closing on Thanksgiving because they’re open all day, every day. They include Wal-Mart, Meijer and some Walgreens stores. Brick-and-mortar stores aren’t the only threat, however. Retailers that choose to sit out the holiday also have to guard against losing sales to online operations. For consumers determined to tackle their gift lists on the holiday, online shopping is an attractive option, Feinberg said. Almost 57 percent of consumers plan to do at least some of their Christmas shopping online, according to the National Retail Federation’s survey. That’s the highest percentage ever, almost 7 percentage points above last year. The survey, conducted by Prosper Analytics & Insights, polled 7,733 consumers between Oct. 4 and 11 about holiday shopping plans. The margin of error is plus or minus 1.1 percentage points. National Retail Federation’s economic forecast was based on various economic data including housing statistics, unemployment rates and monthly retail sales reports. Fung Global Retail & Technology noted that this year’s calendar includes 31 shopping days between Thanksgiving and Christmas, two more than last year. Other factors that will likely drive a spending increase include lower unemployment rates, energy costs and food prices combined with higher wages, the New York think tank said.